Just like every other asset globally, the pricing of Bitcoin is directly affected by the availability of US dollars on trading platforms. Trust in exchanges is a precious commodity in Bitcoin. Exchange counterparty risk is the reason why dollars held on exchanges are in short supply. In April, Bitfinex lost its ability to process dollar deposits and withdrawals. Traders who wanted dollar liquidity immediately were forced to buy Bitcoin and other digital currencies. That forced the price of Bitcoin and other digital currencies into a premium on Bitfinex vs. other trading platforms. The chart above shows the spread between Bitfinex and Bitstamp, and the price of Bitcoin. Bitstamp’s banking relationship remained unaffected, which allowed traders to buy Bitcoin on Bitfinex and sell it for USD on Bitstamp. They could then withdraw dollars. The spread between the two exchanges represents the desire for Bitfinex users to redeem their dollar IOU’s for physical cash. This glorious rally began in the wake of the announcement that dollar funding options were shut at Bitfinex, OKCoin and other exchanges that banked in Taiwan. However as the market continued to rally, the Bitfinex / Bitstamp spread narrowed and turned negative. Without the ability to accept fresh dollar deposits, Bitfinex now suffers from a dearth of dollars. This will cause the price to underperform the global average as the price continues to rally. Tether, a pseudo Bitfinex dollar liability that rides on a blockchain, can be used to arbitrage the Bitfinex discount. Theoretically Bitfinex should convert 1 Tether into 1 USD. Currently traders are unable to deposit dollars to Bitfinex for the purpose of creating Tether. Kraken operates a market where traders possessing USD can purchase Tether. Currently Bitfinex is trading at a 5% discount. Tether / USD on Kraken should theoretically trade at a 5% premium. Anything less than that, and an arbitrage is possible. If Bitcoin continues to rally Tether will be sucked back into Bitfinex. According to Tether, there are 68.5 million Tethers in circulation. Depending on the length of this rally, the supply of Tether that can be used to arbitrage the Bitfinex discount will evaporate quickly. 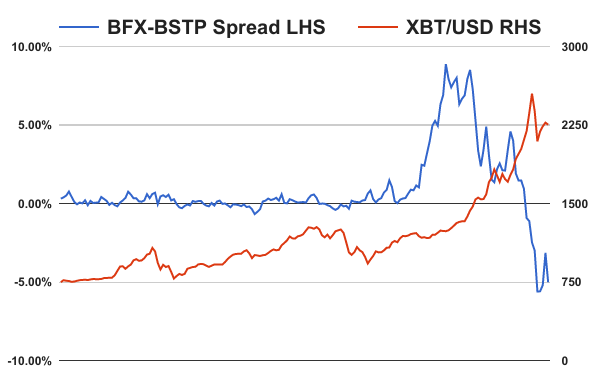 The Bitfinex / Bitstamp spread may transform into a leading indicator of the Bitcoin price. Bullish and bearish traders will go long or short the spread respectively.